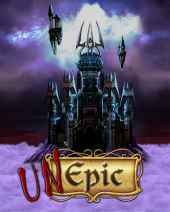 Unepic is a two dimensional, side-scrolling platforming action game with RPG elements, created by a Spanish independent developer. The gameplay can loosely be described as similar to other so-called "Metroidvania" titles (similar to Metroid and Castlevania games), though the author claims to have drawn inspiration from The Maze of Galious, Moria, Diablo, and even World of Warcraft. The game has RPG elements, such as an experience and skill point levelling system used for improving the protagonist's stats. There are also various sidequests to be obtained from many of the NPCs encountered along the way. Several different weapon types exist, each with their inherent strengths and weaknesses. There is also a potion crafting and magic system that relies upon various ingredients looted from enemies or found in chests, barrels, and shopkeeper inventories. Shortly after the story begins, the contemporary protagonist Daniel finds himself transported into a dark castle full of all manner of violent beasts and offbeat characters. There is a distinct focus on humor, and the dialog and even item descriptions are full of pop culture references.